Providing insight to the members of a buying committee can be a very tricky endeavor. In my 25+ years of selling to complex buying committees, I’ve found that although there are a number of ways to do this, two stand out as the primary means. The first (and no big surprise) is through effective development of the needs of the individual members of the buying committee. But because two primary types of B2B buyers have emerged (which we refer to as either Seller Educated Buyers or Internet Educated Buyers), sellers must now be able to discern which type of buyer they are dealing with, and then use the appropriate aligned sales process, culminating with the seller providing her/his insights to help the buyer solve their critical business issue (“CBI”). Selling to the individual buyer is not the primary subject of this article though. It is more thoroughly described in my brief video, Visionary Selling. The second, and the primary topic of this article, is to be able to provide key differentiating insights to the members of the committee as a whole. The seller can accomplish this by showing the buying committee how the CBI of one buyer has a negative impact on another, which in turn causes them to experience their own, unique, CBI. Once the seller has shown these interdependencies, she/he should then show the buying committee how their individual issues culminate by impacting their entire operation, and causing an over-arching organization-wide problem. This can be effectively demonstrated to the buying committee using a visual tool called an Impact Tree™. An example used repeatedly by a customer of mine is shown below. Because they had expanded their offering from a “point solution” (the CAD product) to what they referred to as a “full solution,” they now needed to sell directly to those other departments. Here’s how the Impact Tree worked for them. The sale would usually begin in the engineering department with the Engineering Director, shown above as Al Ligori, who commonly suffered from delayed design of new products. This issue typically impacted both QA and Sales. Delayed design of new products impacted the QA director, Jed I. Knight, because to make up for the time lost in design, new products were rushed to market with undetected faults. Not a good situation if you are producing artificial heart valves. The Sales Director, Marge Innovera, was impacted because her sales team was making delivery promises that could not be met, which resulted in losses to the competition and a decline in sales. The knock-on effect from the QA problem impacted Saul Wellingood in finance by impacting profitability. Then came the over-arching, organization-wide problem: Ultimately, this resulted in missed growth targets, which directly impacted the CEO, Luke Warm. Because my customer was able to provide their buyers with those insights about the interdependent nature of their CBI’s, they were able to achieve buy-in across the committee coupled with the strong, often palpable, desire to now solve this “company-wide problem.” This was the “ah ha” moment for the committee earned by the seller. Insight achieved! Not only did this result in a significant increase in sales for my customer’s CAD point solution, but also in their “full solution” sales. In fact, depending on the product, they saw sales increases ranging from 375% to a whopping 647%! The Impact Tree is not difficult to create. After the sales person has developed the needs of an individual buyer, they simply trigger the impact conversation by asking, “How does your issue impact other people in your organization?” This often results in the buyer and seller “working on the same side of the table” to build the actual Impact Tree, which further results in the buyer both taking ownership of it and providing the seller with quick access to the other buyers on the “tree”. There are many benefits to using the Impact Tree. Lets look at the key benefits for sales people, the sales team, and last but not least, to buyers. For sellers, a primary benefit of the Impact Tree is that it shows the entire buying committee that s/he provides valuable insights. Sales people commonly hear from their buyers that, “You understand our business better than we do.” Is there a higher compliment that a sales person can receive? Not only does this pave the way to a successful sale, but it results in much broader and deeper relationships across the buyers’ organization. It also helps sellers achieve the often-talked about but elusive goal of being considered the buyers’ trusted advisor. The Impact Tree also drives larger sales; rather than selling a “point solution”, sellers are positioned to sell a broader solution to help their buyers solve a broader set of issues. The Impact Tree also significantly differentiate the seller from the competition, while helping them better manage sales cycles to a more rapid and successful conclusion. In Tiffani Bova’s article, Four Ways High-Performing Sales Teams Excel in the Age of the Customer, she states that, “In order to win customer loyalty, Sales must be seen as a team sport across the company.” The Impact Tree is a great way for the entire sales team to understand and keep in the forefront of their minds why the buyers are interested in doing business with their sales organization: To solve their individual issues and the over-arching organization-wide issue. Whether its a sales executive preparing for a meeting with one or more buyers or a product specialist conducting a demo, they are better positioned to understand and align with the buyers and their needs. 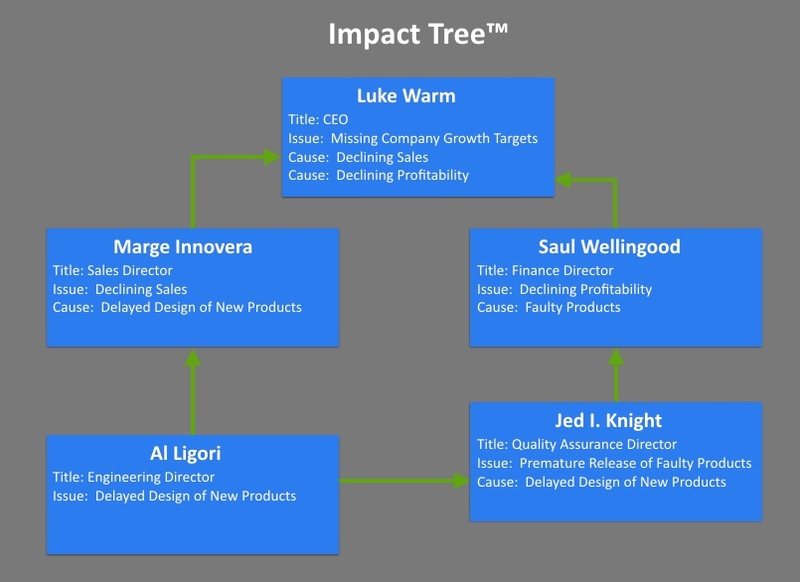 For buyers the Impact Tree helps them throughout their buying journey. Early on it provides them with a way to better understand the issues impacting them as individuals and as a team. It is also key as that journey moves forward, with them understanding the capabilities they need to resolve their issues. That then sets the stage for the sales organization to prove that their products and services will in fact deliver those capabilities. When it comes time to develop the ROI, the Impact Tree ensures that it is developed with the financial benefits that each buyer will receive, not just (using our example) the Engineering Director. It also “hooks” the ultimate decision maker in, which is critical particularly as the decision draws near. In fact, without an Impact Tree many opportunities are lost because the ultimate decision maker has too narrow a view of the potential impact the seller’s solutions can have. However, with an Impact Tree the ultimate decision maker will have, appropriately, a much broader view. Using the above example, the CEO should see that if engineering completes their designs on time, then in turn sales and QA should be able to resolve their difficulties, as would finance, which means that the CEO should therefore be able to achieve company growth targets. And finally, at the end of the journey, when the buyers make their decision, the seller should ensure that the Impact Tree is front and center, for it summarizes the issues the committee needs to solve, and the committee should be quite confident in their ability to do so using the seller’s solution. Incidentally, Impact Trees, such as the one shown above, are now created in our Salesforce app, Adventace SMS™, using GoJS technology. Provided below are testimonials from customers about the successes they have had using the Impact Tree. We were able to turn a loss into a $20M win with our largest customer. I don’t make a sales call unless the sales person first provides an Impact Tree™.